ProForm SMART PRO 12.9 Elliptical Trainer Review by Industry Experts! The ProForm SMART PRO 12.9 Elliptical Trainer is On Sale! Total Body Fitness with Motivational Technology! ProForm is part of parent company ICON fitness, who are also the makers of NordicTrack machines. They offer machines with more bells and whistles than a lot of the competition at a really low price. Their flagship technology is iFit Live, which is fully available on the ProForm SMART PRO 12.9. MID-WEEK SALE ENDS THURSDAY: ProForm just reduced the SMART Pro 12.9 to $1,399 with Free Shipping and 1-year FREE iFit Membership. Interest Free Financing is Available! 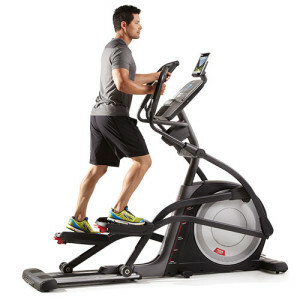 What’s New on the SMART Series Ellipticals? The SMART series from ProForm was released back in Spring 2018. It comes with an upgraded console that works better with iFit Live. This includes a better quality HD touchscreen with a faster and more responsive touchscreen. 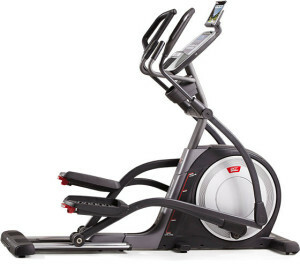 The SMART series ellipticals also come with 1-year iFit membership included in the price. 32 Lb. Flywheel — This is one the heaviest flywheels you will find on the market. A heavier flywheel will provide a more natural and fluid-like elliptical motion. It makes you feel like you are running in the air. Full Color 7″ Smart HD Touchscreen — A bright 7″ touchscreen will make it easy to navigate through your programs with a familiar Android browser. Swipe your finger to check your speed and distance stats. For comparison, the ProForm SMART Pro 16.9 has a larger 10″ HD Touchscreen for around $200 more. 20 Degree Incline – Target your glutes, quads, and calves with the incline feature on the ProForm SMART PRO 12.9. We found that it adjusts easily and quickly. Tablet Holder — It may seem strange to rave about this simple feature, but it’s actually extremely useful. You’ll never need to balance your expensive device while you workout again! This shelf will keep it safe and secure. The lower model, the ProForm Pro 9.9, doesn’t have a tablet holder. account, set goals, and track progress over time. Best of all, you can create custom workouts that simulate terrains in fun locations like Paris, the Swiss Alps, or the coast of Chili. The incline will adjust through a Google Maps syncing feature to mimic the actual hills and valleys. Be aware that iFit does require an extra subscription fee. If you’re unwilling to pay this regular fee, then there’s no need to pay for a machine with this level of technology. 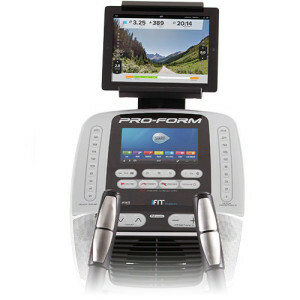 Of course, most of the nicer machines from ProForm and NordicTrack come with iFit whether you like it or not! Note: At the time of this writing, this machine comes with a FREE 1-year iFit Membership. 35 Installed Workout Programs — “Just Press Start and You’re Off!” The PRO SMART 12.9 has 35 programs designed by personal trainers. They will help add variety to your daily workout. Multi-Grip Handlebars — Challenge your arms, shoulders, back and core by adjusting your grip while you workout. Speakers & iPod Input — Speakers are common on these types of machines, but ProForm has speakers that are better than most. Easy Assembly — The ProForm SMART Pro 12.9 comes with easy out-of-the-box assembly so you don’t need to spend hours putting your machine together. Our team members have spent up to two hours on some machines so this is a breath of fresh air! Cool Air Fan – The fan comes with two speed settings. Extensive Warranty —Lifetime Frame, 5 years parts, 2 years labor. Great warranty! Heart Control – The PRO 12.9 comes with pulse grip sensors and a free wireless chest strap. This is a ~$50 value for FREE. Not bad! If you’re looking for a machine with a wide range of technology features at a reasonable price, then this is a great machine to check out. It compares well to the other PRO line models. The ProForm SMART Pro 12.9 is a better value than the Pro 9.9 because it has a heavier 32 lb flyweel, more programs, a 7″ HD Touchscreen (vs a 6″ backlit LCD screen) and a stronger warranty. It has similar features to the SMART PRO 16.9 from ProForm. The main difference is that the PRO 16.9 has a 10″ color HD touchscreen instead of only a 7″. But let’s face it, we’re on the machine to work out, not enjoy a cinematic feature, so a smaller screen may be worth it for a few hundred dollars in savings. Plus, you can spend the extra money you save on a smart tablet of your own. It’s up to you! Regardless which PRO model you select all are good values which is why NordicTrack is the largest fitness equipment manufacturer in the world.